This page is dedicated to people who helped musicians but were not necessarily musicians or in bands. Probably the most notable are the parents of the Oelwein musicians who supported their kids interests. This involved tolerating their practicing, buying and moving their equipment, late night feedings after gigs and coping with everything else young musicians will try to get away with. 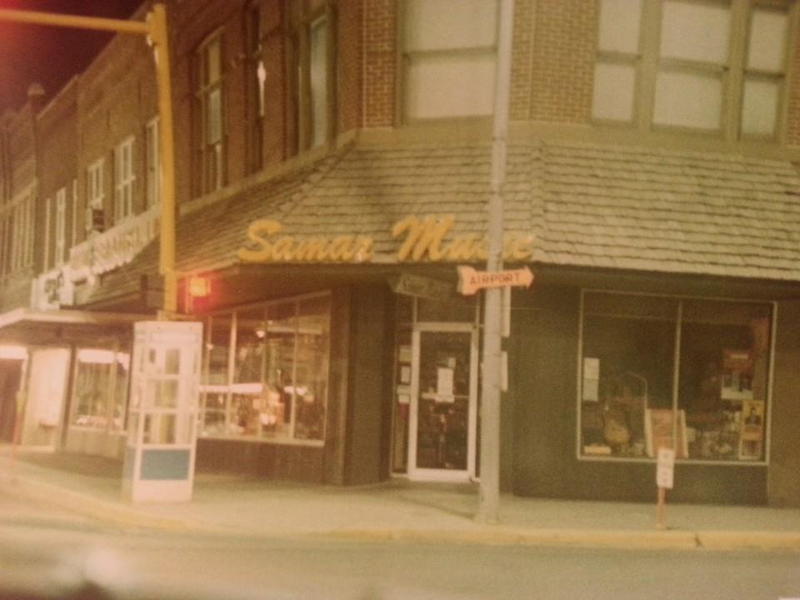 Sam Mazziotti – Former Mayor of Oelwein (served during the “68 tornado) and owner of Samar Music (see picture to the right). Sam went out of his way to help young bands in Oelwein by selling, renting or even letting musicians borrow equipment for gigs. 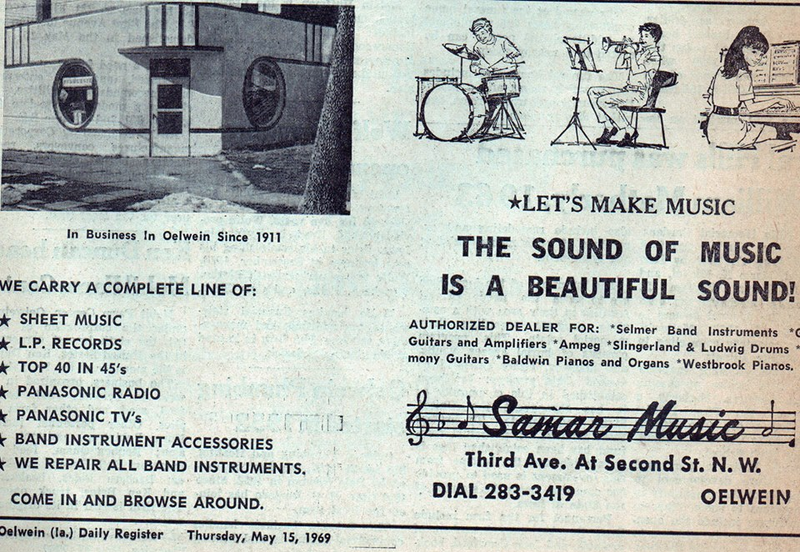 In addition to selling professional band equipment, he also had all the current records for people to browse and buy. Sam ran what musicians call a “Pro Shop” featuring high end Gibson & Fender guitars and Marshall & Fender amps. They also carried PA equipment and a constant supply of reasonably priced used equipment. Sam’s son Jim Mazziotti, ran Samar in the later years. Bob Hines – Oelwein insurance agent, father of Jim Hines and manager of The Pages. He taught and mentored other local bands how to be professional and succeed with their musical careers. Bob McNamara – Owner of the Wildwood. Bob brought in many bands to play at his club. Lou Stasi – Owner of Luigi’s. Lou presented live music featuring local bands at his place for years. Jay Sieleman – Jay was the number one fan of live music in Oelwein during the 70′s. His enthusiasm while watching Oelwein bands inspired both the musicians and audience members. He has taken that love of music and is now known world-wide for his efforts in leading The Blues Foundation (www.blues.org) in Memphis Tennessee through his role as the President and Chief Executive Officer. Read about his life, including his Oelwein days here. PeeWee Cherrier – In addition to him being a member of the Andy Doll Band, PeeWee repaired guitars and helped bands setup their PA systems. Dan Malloy – High School choir director, owner of the Oelwein based Malloy Piano Factory, and namesake of The New Danny and the Juniors. In addition to teaching hundreds of kids how to sing harmony, he also provided a rehearsal space for bands in the basement of his piano factory. Check out his present business, Dan Malloy Specialty Pianos and Restoration, in Cedar Rapids. George Foy – Oelwein High School band director and creator/band leader of Tuxedo Junction. George was responsible for teaching kids how to read music, play their instrument and how to get a “band” sound. In addition to leading kids through marching band, pep band and symphonic band, he regularly had one of the best student jazz bands in the state. Foy also took his student jazz bands on the road to numerous jazz clinics which featured professional musicians and his players received multiple awards due to his personal lessons and coaching. Al Enyart – He is actually from West Union, but he ran a booking agency called “The Agency” that many Oelwein bands used to secure jobs. He was a major factor in providing money paying gigs that supported Oelwein musicians. Dale Wood – KOEL AM – Inducted into the Iowa Rock and Roll Hall of Fame in 1998. Dale has been recognized as being on of the first radio DJ’s in the state to start playing the rock format on AM radio. As a way to promote his station and his ever popular show, he began to promote record hops and live appearances with the legendary hero’s of rock and roll. Artists such as Buddy Holly & The Crickets, Jerry Lee Lewis, Conway Twitty, Dion & The Belmonts, Bobby Darin and Gene Vincent and His Blue Caps. He also promoted local music and played our local musicians on the radio. Jack Mihall – KOEL AM – Back in the 60’s you could still play local bands on the radio and Jack did that. Mihall was one of the first radio promoters of the local rock scene. He also took his show on the road and entertained teenagers throughout Iowa by spinning records for their local dances. Jack played a huge part in the career of The Pages. He had heard them play live and invited them to the Lakeside Ballroom to perform during his 15 minute breaks. He provided them one of their first big gigs that led to their huge career. Bobby Hankins – KOEL AM – In addition to fronting a great band, Bobby worked at KOEL and brought a lot of big name country artists to Oelwein and then promoted them on the radio. You and your booking company The Agency provided many opportunities for bands from Oelwein and NE Iowa. Funny that Louie Chase would be the first to comment. I only went to the Armory once and I am sure I was young enough that I was not suppose to be there then either. What I remember from that one night after all these years was watching Louie Chase dancing to Wilson Pickett’s “In the Midnight Hour.” Some years later we became friends, but at that time, I was getting a sneak peak at how much fun my life was going to become once I got just a little bit older!! My dance years really began at the Coliseum. What about George Foy, from the group Tuxedo Junction, he became the band instructor at Oelwein High School until he retired. He taught a lot of us how to play music, with all the different instruments plus all the different band groups. Gary – How did I forget George Foy? I just added him. Personally, I learned so much from my time in George’s high school jazz band. I especially appreciated how he would write 16-32 bar improvisation sections into his arrangements to feature his student’s free-form solos. Thank you Gary for keeping me on my toes and thanks to George for instilling the joy of live performance into his students.